A unique book, with the ambitious aim to change the current economic system and the international organizations, so that we ensure a sustainable future for our planet. 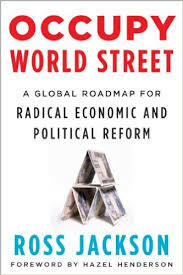 Ross claims that a new “Gaian paradigm” is emerging across the globe, one that rejects the dominant but failing free market, materialistic ideology and promotes a more Life-based economic and political system that protects the environment, diverse cultures and social structures. Ross puts forward a concrete two-pronged ”breakaway strategy” to bring about the necessary reforms. The key initiative is that a few of the smaller nations take on a global top-down leadership role at this critical time in history by breaking away from the dominant and destructive neoliberal political/economic system that is leading us to disaster and replacing it with new institutions of global governance and trade that will regulate intergovernmental relations for member states, while protecting the environment, human rights and social structures in a democratic ”Gaian League” —a parallel model for a new civilization that other states are welcome to join when they are ready. The second prong is the bottom-up pressure from thousands of NGO folks in the streets demanding a referendum on their country joining the Gaian League because it stands for everything their leaders claim to believe in, but seldom execute in practice.